Just A Last Minute Trip . . . 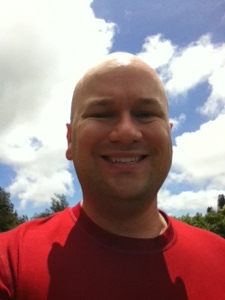 This past week I took a last minute trip to Kauai. I had lovely time exploring the Island and more importantly spending a few hours with a dear friend from college. Here is a slide show from the trip that features the song Forever Summer by Anuhea and Justin Young. I must have heard this song on the car radio six times a day. Just Coasters . . . 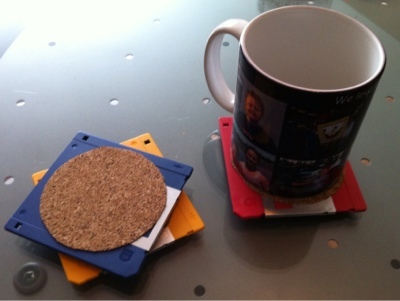 The Recycled 3.5 Diskette Coaster. 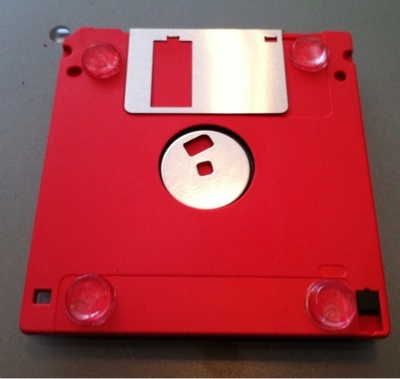 I am sure everyone has a few of these obsolete data storage disks laying around their house that they no longer use. How about turning them into a functional conversation piece for your next cocktail party. Step One - Clean 3.5 Diskette of any dust or dirt. 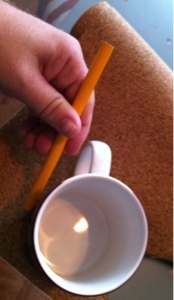 Step Two - Use the Pencil to trace the bottom rim of the Large Coffee Mug onto the Self-Adhesive Natural Cork Liner. 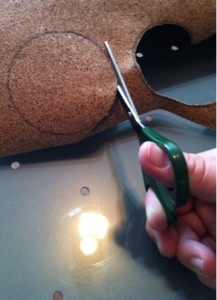 Step Three - Use Scissors to cut the Self-Adhesive Natural Cork Liner in the shape of the Large Coffee Mug you just traced. 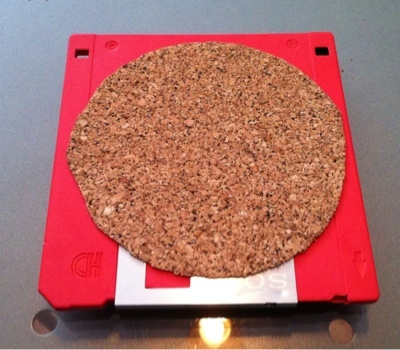 Step Four - Peel and firmly stick the Self-Adhesive Natural Cork Liner to the top center of the 3.5 Diskette. 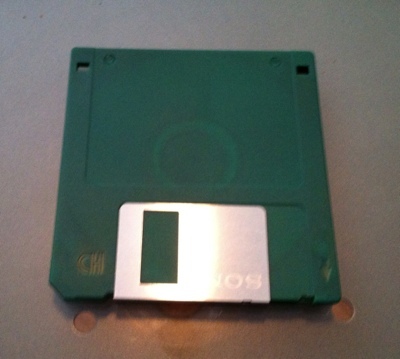 Step Five - Firmly apply 4 Self-Stick Rubber Pads to the bottom four corners of the 3.5 Diskette. Step Six - Enjoy your new coaster! Optional Conversation Piece - Leave any labels on the 3.5 Diskette that would indicate what was once stored on the diskette. 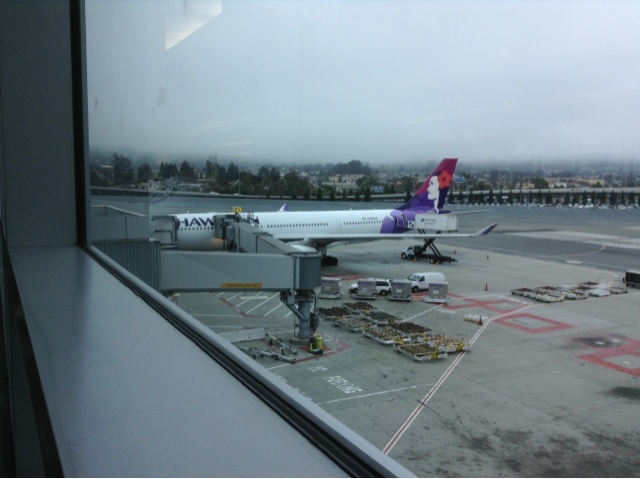 Just Seven Days Of Oahu . . . While driving around the Island of Oahu listening to the radio a song came on that sounded familiar; like I should know it. Try as I may I could not place it. I pulled out my smart phone and "Shazam"ed the song. "Paula Cole - Feelin' Love"? Hmmm, I wouldn't call myself a Paula Cole fan. That "I Don't Want To Wait" and "Where Have All The Cowboys Gone?" songs were really over played. But this "Feelin' Love" song had a nice groove going on. By the time I got back to the hotel I looked for the song on iTunes. I listened to the snippet again. Wait a second. I know this song. I own this song! This song is on the City Of Angels Soundtrack; that awful Meg Ryan and Nicholas Cage movie from 1998. But the version I just heard on the radio was a remix and even better than the original. So when I was picking the song to play with the photos of my trip I knew I had to use Paula Cole's Feelin' Love (Psychemagik Reem Mix). 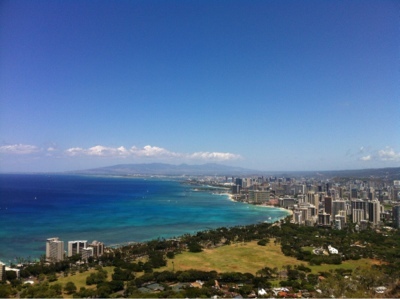 Just A Climb To The Top Of Diamond Head . . . 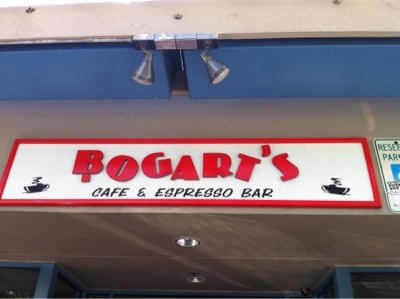 I started today off at Bogart's Cafe & Espresso Bar which I found recommended in that trusty Blue Book. Bogart's had me when I looked up the menu online and saw the "Crab and Avacado Omlette." The Blue Book also said "Nobody can beat their roasted potatoes." This was another place with a healthy line that never diminished. The parking lot is tiny and the seating space inside is minimal but I was able to secure both of those items with ease. 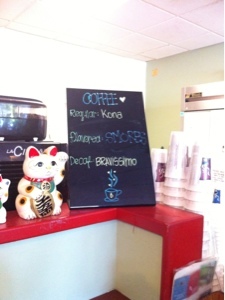 I wasn't going to order coffee, but then I saw the flavor they were offering was called "S'mores!" "Can I get that as an "Ice" coffee?" I asked. The coffee tasted exactly like S'mores, but I think it would have been better hot. 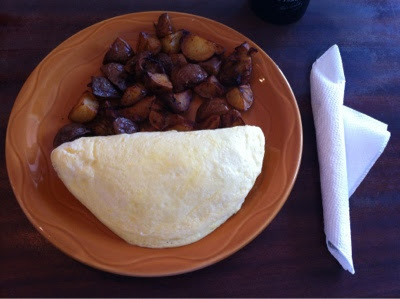 The Crab and Avacado Omlette was the lightest fluffiest Omlette I think I have ever had. The potatoes were just "OK."
One thing to note if you go to Bogart's is that they are cash only. 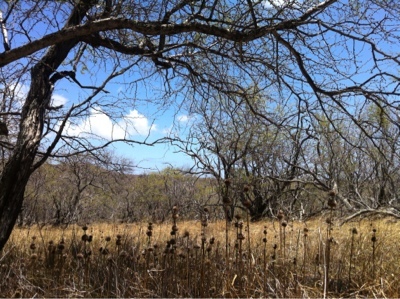 After leaving Bogart's it was a short drive to Diamond Head State Monument. There is a small parking lot on the Crater floor that costs five dollars. I think I arrived at a very popular time as the lot was full and I was turned away. 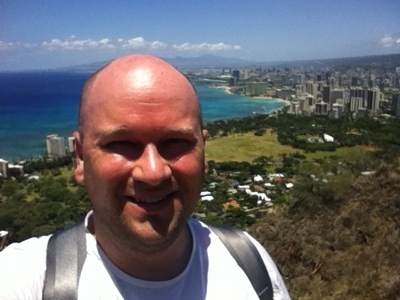 Since I wasn't sure how strenuous the actual hike would be; especially under the mid day sun; I opted not to park outside of Diamond Head and hike back in. I drove around the mountain to kill some time and then attempted to park in the Crater again. This time they let me wait till a space opened up. The hike to the top is .8 miles one way or 560 feet up. While climbing to the top you traverse uneven steep terrain, go through tunnels, and assend multiple stairwells. It amazed me to see some park visitors attempting this climb in flip flops, bare feet, dragging a baby stroller, and my personal favorite, wearing jeans and cowboy boots! 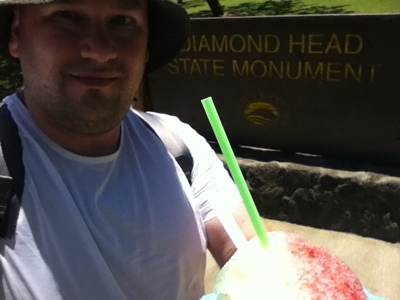 When you finish the hike; conveniently located in the parking lot is a food truck selling shaved ice. Yes please I deserve this! 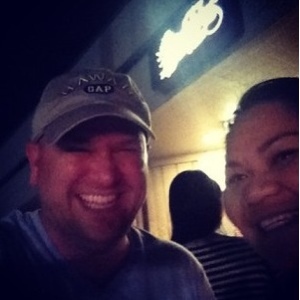 The night before, when I was hanging with my friend Claire, she stopped for dinner at Teddy's Burgers. As you may recall I had already enjoyed my first Udon experience so I did not eat anything at Teddy's. That being said, her burger looked amazing and I had a major case of burger envy! 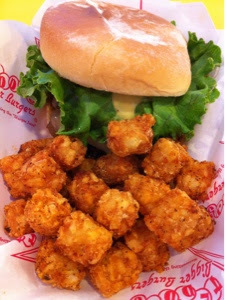 When I found that Teddy's was listed in the Blue Book, I had to go back and try a Teddy Burger of my own for dinner. Any restaurant that has the side option of "Tots" is A+ in my book. For the record, the burger was as good as it looked the night before. After Teddy's I swung by Shirokiya. A sort of Japanese Department Store that has a food court. 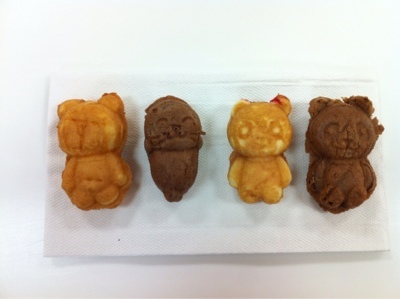 I had seen these Kulu Kulu Honolulu Mini Waffle bears that I wanted to try. 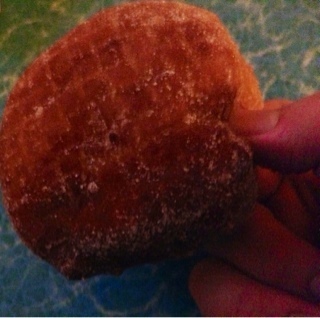 They come filled with jellies, chocolate or custard. How cute and convenient are these little bear treats? Just One Meal To The Next . . .
Today was one of those days that seemed to be all about where is my next meal coming from? 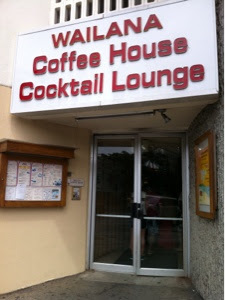 I started the day off at Wailana Coffee House; which apparently based on the sign doubles as a cocktail lounge at night. Wailana Coffee House is straight up state of the art if the year was 1960. From the faux dark brown wood paneling to the orange brick interior facade to the speckled green Formica counter tops. You can't help but look around and think that this was a happening place back in the day. I was intrigued by an item on the menu called the Pancake Sandwich, but when I placed my order the waitress told me I should just get the "All You Can Eat Pancake Breakfast" instead because it was more food and cheaper. 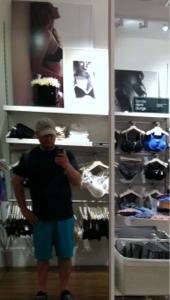 Apparently she sized me up and knew I was president of the Chub Club. I asked if it would still come like a sandwich and she said, "No, it all comes separate but you can put it together yourself if you really want to." I took it as is. this happened. It was only a matter of time right? And since I was there I might as well check the signage on the camisoles. Good job Ala Moana, your signs were compliant. 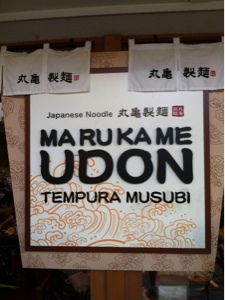 Next up on the food adventure was Marukame Udon. This was another recommendation by my co-worker. Believe it or not, I have never ordered udon before. 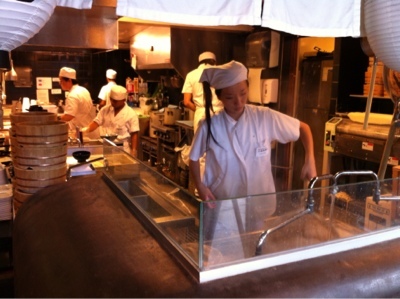 Marukame is organized cafeteria style where you pick up your noodles then your tempura and drink. It must be good because the line to get in stretched down the block. The line moved very quickly and I started to get a little stressed out because I realized I had no idea how to order udon or how to pronounce the different udon offerings. I didn't want to repeat the embarrassing meal a few years back when I ordered Pho for the first time. I didn't know you were supposed to mix all the ingredients in the bowl and I ate them all separate as a packed restaurant watched with equal parts shock, wonder and awe at this fool who didn't know any better. I pulled out my smart phone and started googling the menu items so that I could understand what they were. 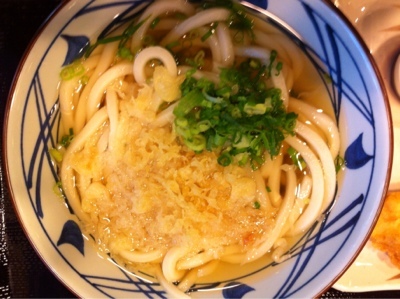 I decided that Kake Udon was probably the simplest and safest bet for me. It was basically plain noodles in broth. The udon was good, but I have nothing really to compare it to. What I enjoyed even more was the tempura. I had sweet potato and pumpkin. They were delicious. 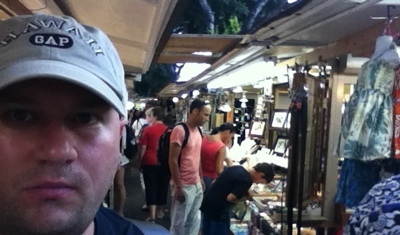 While walking back to the hotel I stumbled upon Waikiki's equivalent of LA's Olvera Street. A long aisle of narrow carts selling Hawaiian trinkets that are probably made in China. Later in the evening I met up with my friend Claire who lives on the Island. She took me to Bubbies. 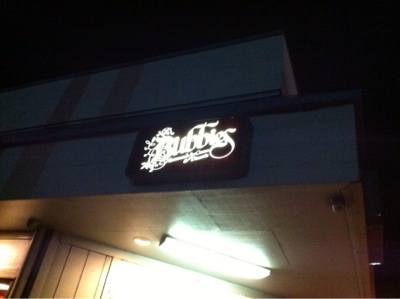 Bubbies is a Mochi Ice Cream shop and it was HEAVEN! Once again there was a line to get in, but it was worth it! 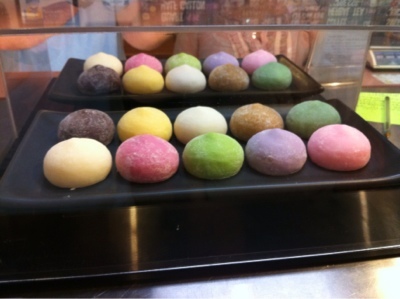 I got four mochi. Green Tea, Chocolate Peanut Butter, Honeydew and Chocolate Dipped Raspberry. My mouth is drooling just thinking about those last two. Thanks Claire for taking me to Bubbies! So good! 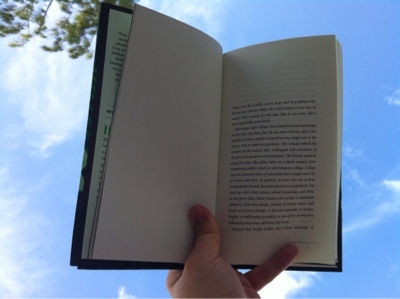 Just Some Sun Some Sand Some Water And A Good Book . 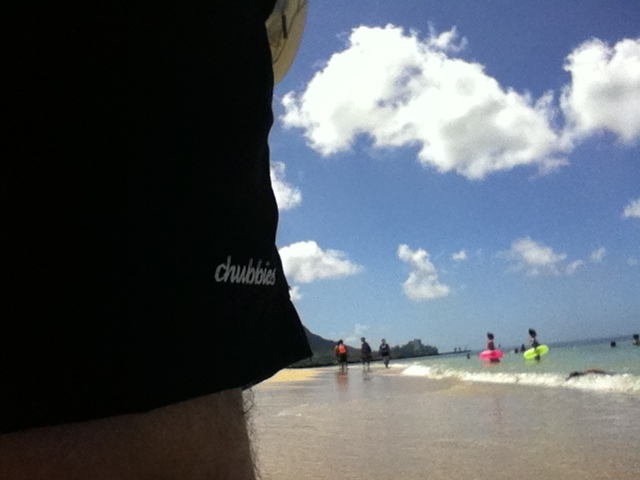 . .
First full day on Oahu and I bathed myself in SPF 50, threw on my Chubbies (A San Francisco shorts Company started by a friend of mine) and headed out in search of Eggs N Things for breakfast. Eggs N Things was on the list of "must eats" provided by one of my co-workers. 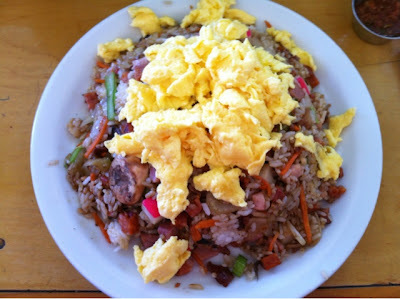 I ordered the Island Style Fried Rice and Eggs. It was massive! Honestly, I am not sure what all the ingredients were but it was quite tasty. After Eggs N Things I took a drive up to the Pali Lookout. 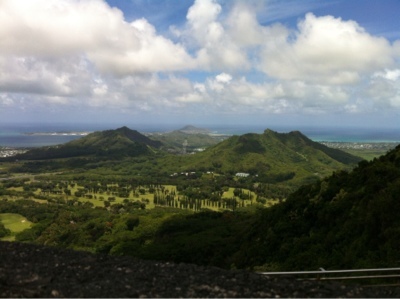 The Pali Lookout is at the 1,200 foot elevation and has an awesome panoramic view of the East side of the Island. That famous "Blue Book" I have written about in all my Hawaiian adventures said to bring your warmest clothes when visiting the Pali Lookout. Man, that book was not kidding. The winds at the top of the Pali were some of the strongest I have ever felt. I am not sure if the Japanese tourists were screaming in fear or joy at the power of the wind. The wind was so strong my cheeks were flapping! After leaving the Pali Lookout I went in search of a beach to sit on and read my book. 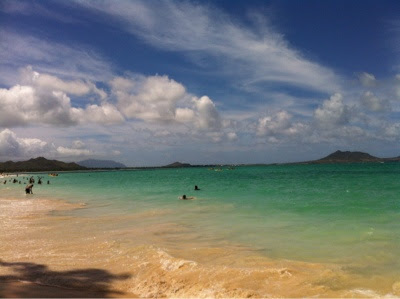 I was looking for Lanikai Beach, which was also recommended by my co-worker, but apparently I pulled off the road too soon and ended up at Kailua Beach. It was still beautiful and was exactly what I was looking for. And a place to read my book. After spending a couple hours at the beach I decided to take the long way back to my hotel and drive around the South side of the Island. By the time I got back to the hotel it was getting late and I was hungry. I took a shower and went back out in search of food. 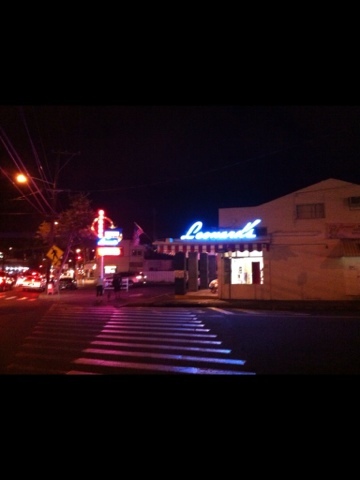 More importantly I knew that after dinner I was going to top it off with another recommendation, Leonard's Bakery's delicious Malasadas. All in all a good day...except for the fact that even though I started the day bathed in SPF 50 and sat under a shade tree to read my book; somehow I got a little sun burned on my feet and head. Just One More Time Around . . . I am not one to arrive early for anything. On time or a minute late; that is more my style. So I knew things were too good to be true when my bag was already packed for my 9:20 am flight the night before my departure. It should not have come as a surprise when I slowly awoke to my alarm 45 minutes after it started playing. I wanted to be leaving for the airport in 15 minutes and I am just waking up now? "It's OK it's OK," I told myself; "You are already packed, You can still do this." So I powered through my morning routine and called for the Black Car service with my smart phone App. Technology has advanced to the point that I can "drop a pin" on the image of a map on my cell phone to indicate where and when I want to be picked up. Despite the fact that I am fairly confident on where the door of my condo is located, for some reason the Black Car service always shows up a block away on the other side of the street. "Mr. Just Jon, your car service is here. Where are you?" the driver said upon calling my cell phone. "I am standing where I dropped the pin on the map. Where are you?" "Well Sir, the GPS told me to make a right turn." "Is the pin at a right turn?" "Turn around and cross the street. I am standing outside...where the pin was dropped." I have gotten quite used to having this same conversation with every driver that has come to pick me up. Now let the record state that I live REALLY close to the airport. I am talking super convenient. So when the Black Car service driver asked what time my flight was (2 hours from the point of his arrival) his response was, " Oh you are going to get there way early. Plenty of time!" Let's just say I have made this trip enough times to know that early morning long distance flights for all airlines tend to all depart at similar times which makes checking in and getting through security a beast. "You think?" I said. "I don't know. I have seen it pretty crowded at this time." "No, you are good. I mean, I guess it is good you are getting their early because there is some fog." "Wouldn't that mean a delay if there is fog," I thought to myself. The driver then proceeded to tell me repeatedly as he filled out paper work that the Black Car Services' yard is just five minutes from my condo. "I mean you are right there," he said. "Well if you are only five minutes away why did it take you twelve minutes to get here?" was the question running through my head. And what was with this paperwork? The beauty of this service in the past is that everything is pre-arranged in the App. No paperwork. Let's cut the chit chat and get this car rolling dude, or my "early arrival" you seem so concerned with will be practically non-existent. "Is this paperwork thing new?" I asked. "Oh, we have been doing it a couple of months. Ever since the airport started cracking down on the unlicensed ride share drivers," he said. "Yes, I was just reading about that. I thought your Company's "cheaper" service "X" is now not allowed to go to the airport," I asked. "Oh, I don't know about that. I don't drive an "X" car. I mean that is what they start you out on. The rookies. Like a training car. I haven't done that in over a year," he said in an almost bragging tone. We finally got on the road and made it to the airport with no trouble. As we entered the departure level I saw my airline listed on the first sign. And then I saw my airline disappear as my driver kept going. "Ummm...I think you just passed my airline," I said. "No, your airline is in Terminal 2." "Uh, well, I am pretty sure we passed it. But if you think it is in Terminal 2, we shall see." As we cleared Terminal 1...2...and 3; I think it was time for my driver to admit defeat and circle back around. "Oh man they are going to think I am crazy. It costs $3 every time we go around." We started the loop back around to Terminal 1 when I thought to myself, "This fool just took the wrong ramp. We are now on the Arrivals level!" "Uh...I think we are on the wrong level," I said. "Oh man, I am so sorry! I will get you there now. I know exactly where it is. This is going to cost me another $3, but I know it is the first Terminal. Don't worry." Frankly, I wasn't worried. I wasn't even mad. This was down right funny. We looped back around for another $3 and as we approached the departures level I said, "As we come out of the tunnel; it will be the first stop on the right." My driver began reading the signs. He read off every airline but the one I wanted. I interjected, "Not that sign. The smaller sign to the right. Do you see it?" "Oh yeah. There it is," he said. After pulling up to the curb and getting out of the vehicle; I thanked my driver and wished him a good day. I thought again about how he said only the "rookie" drivers operate "X" cars. Three attempts at finding my airline seemed like a pretty rookie move to me. "I don't know man, after this rough start?" he said. "Dude, you just got to shake it off," I said as I turned and walked through the sliding glass doors of the terminal. "You just got to shake it off." I've got a flight to catch! 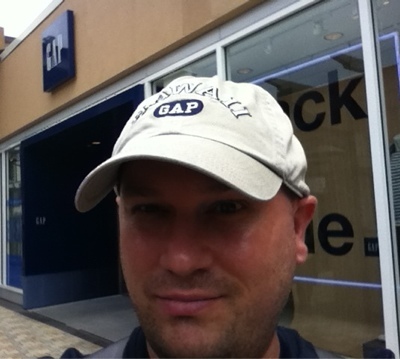 A "Borderline Tacky" story of my life in the City by the Bay! I Have Already Tasted My Piece Of One Sweet Love. . .
Just A Sandwich Sign . . .
Cha Cha Cha Don't You Know That I Love You . . .
God Makes No Mistakes . . .
We Found Love . . .